UPDATE: The glitz and glamour and Carey/Tobey/Leo group shots that came with all those Gatsby premieres are behind us now, but there's fresh excitement ahead. The title is finally hitting DVD/VOD/iTunes, etc. next week, on Tuesday, August 27. To celebrate, we're giving one of you guys a Blu-ray combo pack (including a normal DVD, in case you happen to be Blu-ray-less) for free. Just take to the comments with a vote for your favorite Fitzgerald story or novel, add in some proof of its superiority, and we'll announce a winner on Monday, August 28. Some of us really love Baz Luhrmann. We might own Moulin Rouge and have dreams of dying glamorously young (of consumption, of course) as a result. We might also contend that Romeo + Juliet is a pretty compelling reading of Shakespeare's most overexposed play (The dolls in her bedroom? Genius.). Oh, and that Chanel ad he made? Magical. However, none of that meant that we had particularly high hopes for the Australian director's retelling of F. Scott Fitzgerald's most famous work. Mostly because Luhrmann is all about glitz and glamour and in-your-face explosive moments, and Gatsby's about the slow burn — the unspoken regrets and the quiet passion. And yet, we thoroughly enjoyed it. We're still a little perplexed about why it was shot in 3-D, but let's overlook that. And, we're also willing to overlook the overly stylistic moments that are Luhrmann's calling card. Because we feel like he understands the character study that is The Great Gatsby, and he mostly does it justice — without ever getting bogged down by an overly romanticized idea of what is essentially one of the worst love stories, ever. Fitzgerald, in his dysfunctional marriage (see: Tender Is The Night and The Beautiful and Damned), with his outsider-looking-in obsessions (Tobey Maguire is the most wonderful stand-in for the writer, in his role as Nick Carraway, by the way), wasn't trying to create some beautiful snapshot of an inspirational love affair. 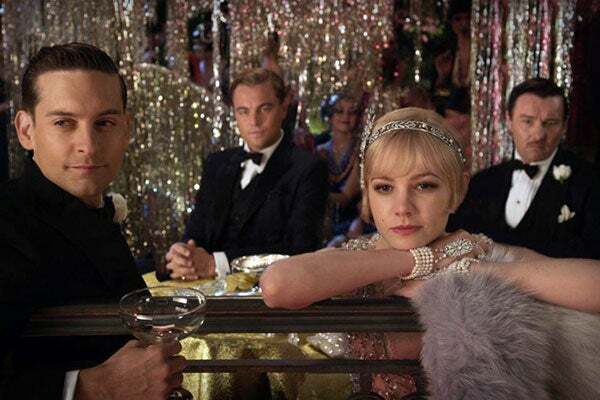 In his novel, he might write that "it was all for her," but Daisy ultimately exists to inform our understanding of the rags-to-riches story that is Jay Gatsby. And don't worry; we're not here to complain about her lack of agency or her inability to make a decision or a commitment. She isn't a disappointment because she's a woman; she's a disappointment because she's a piece of a careless, reckless couple representative of a careless, reckless society. And Baz Luhrmann shows us all of that. Beautifully. He's never distracted by the romance, although the tender moments of awkward reunion feel believable in a slightly more unorthodox fashion than we might have expected. No, he sets the shallow mirage of devotion to Lana Del Rey (An intentional wink? Probably not, but we had to ask. ), singing, "Will you still love me, when I'm no longer young and beautiful." And the answer is no. We all know that, and fortunately, so does our director. Are there moments where Luhrmann beats us over the head with symbolism? Obviously. Are there strains of ideas that he picks up and can't quite follow through on? Absolutely. Particularly his treatment of race and discrimination. He pokes at the idea, with a little help from Tom and Daisy, but he can't quite complete his thought, and ultimately, he abandons it altogether, in favor of keeping focus on the title character. But he does that pretty well. He toys with the timeline in which we receive information, but it all works. Relying heavily on a narrator (Maguire as Carraway, employing the same typewriter trick as Christian in Moulin Rouge, particularly for those powerful closing lines), he shows us not just the glossy parts and the ugly parts of the glorified gangster, but also the conflicted parts — the ones the character can't understand, and the shortcomings that ultimately lead to his demise — in a pretty even-handed way. So, what we're saying is this: Do we want to see Luhrmann adapt our favorite Fitzgerald work, This Side of Paradise? Not really. But did the movie make us revisit some of our ideas about a short-lived Golden Age and its obvious parallels to the present day, as well as our understanding of Gatsby himself? A little bit. So...success!